For an easy introduction to Angkor and Angkor Wat the best route follows the Angkor circuit tours, starting with the small circuit, then moving on to the grand circuit (also known as the big circuit). Both should be covered with two day tours and while these circuits or loops are said to be the ‘touristy’ option, to travel to Angkor without covering the main sites is little more than daft. 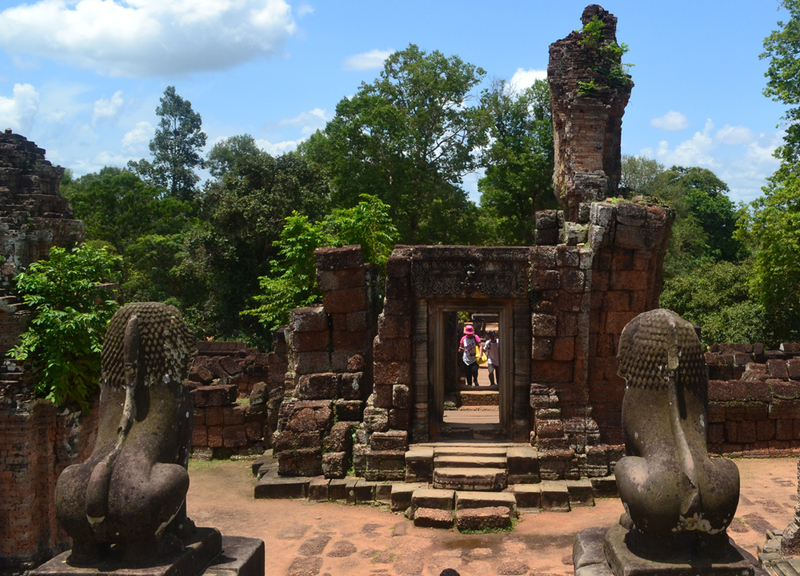 It is best to cover these temples on the first two days before venturing further to less the visited ruins of Angkor. Below follows my recent visit (July ’14) which was my first in 8 years (my previous visit in 2006) and few things have changed (bar my beer belly and half a beard). Note, for travel to Angkor you will need to stay nearby in the town of Siem Reap (Nearby Hotel List Here). There are 3 ticketing options available at the front ticket office; 1 day ($20), 3 days ($40) and 7 days ($60). The one day will cover the main sites and the simple introduction to Angkor. The 3 days will cover the two day tours leaving the added day to venture on. Seven days is for the enthusiasts (or slow people) and could easily be filled with hiking trails and far-flung Khmer ruins. To date I’ve only covered the two day tours and have no itching desire to push further. Khmer temples are found all over Cambodia and in neighbouring Thailand and I’ve seen my fair share by covering lesser known and more remote Phanom Rung in Thailand and the border temples of Cambodia. Note, tickets will show photos on them so you can’t split or exchange passes with others. They will also be checked on entry to main temples. Ticket photographs will be taken at the ticketing office (regardless of bad hair days..). If visiting on a 1 day or 3 day pass the local Tuk-Tuk or motorbike taxis are your best bet (over walking or cycling). 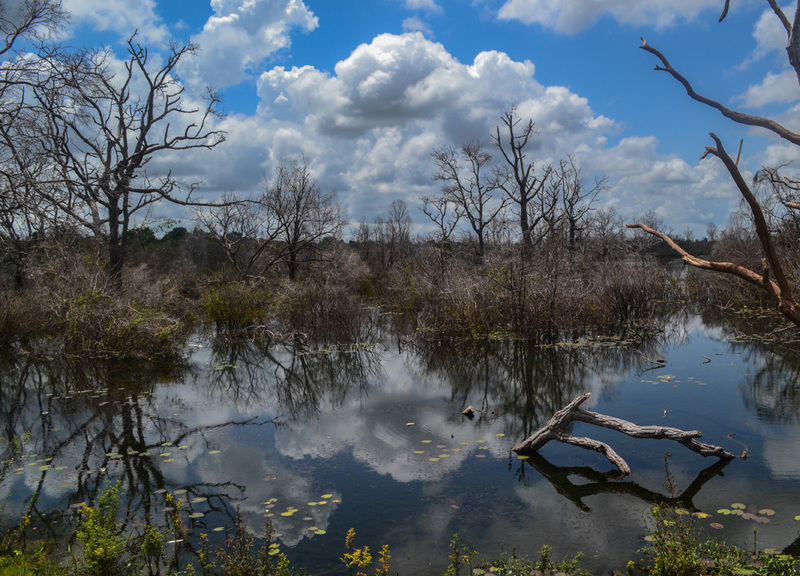 The areas of Angkor are vast and even the trek from Siem Reap will be too much for some (or maybe that’s just us). Motorbike taxis are the quickest mode to explore but prices will be similar to Tuk-Tuks so if not travelling solo the savvy option is to take the tuk-tuk. Motorbikes can (now) be hired but aren’t recommended with roads of endless potholes and local’s lack of road rules (we saw an accident within minutes of our first day, below) . So we go with the Tuk-Tuk option which proves to pay off as the rains hit hard throughout the day and cyclists scarper to find non-existing shelter. Air-conditioned cars also come at a higher price (add $10 or so to the Tuk-Tuk). For the small circuit tour (full day tour) it costs $15 by Tuk-Tuk and if you plan on watching the early sunrise it will be an extra $5 (prices vary). For sunrise the pickup is at 5am so chances are you won’t make it through to sunset which maybe best left to the 2nd day (or vice versa). 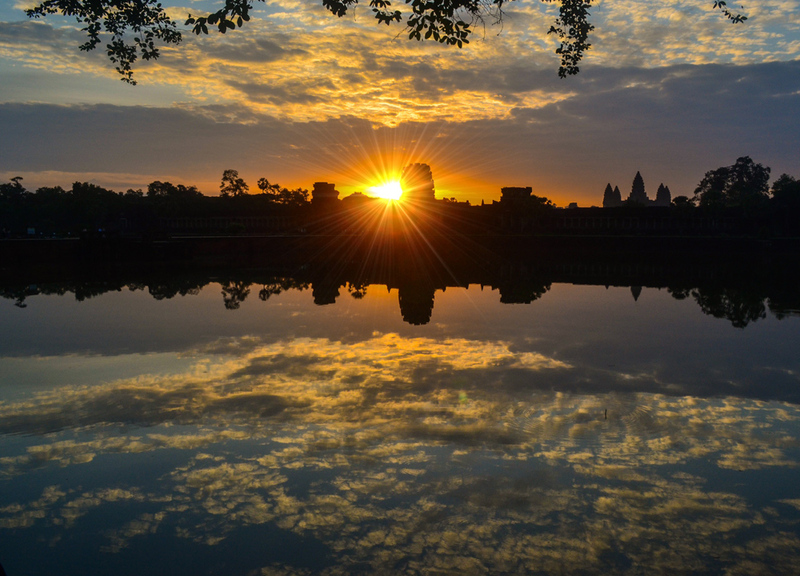 The best views for sunrise are from the moat of Angkor Wat and this option can be easily added to any circuit or day tour. The best point for the evening sunset is Phnom Bakheng which is normally included with the day tour price. On any given tour; expect a lot of heat, humidity, sweat and during rainy season, rain. Below follows the small circuit introduction to Angkor. The first stop on the circuit is the iconic Angkor Wat the largest religious monument in the world which often overshadows the other temples of Angkor (but it is only the beginning). Cross the moat, pass through the front gates, follow the walkway, explore the central structure… Angkor Wat alone takes roughly two hours and when caught up in the stories, the intricate carvings and the history this can take even longer. Angor Wat sits direct at the front of this ancient city and you’ll likely pass it twice, daily. The compound of Angkor Thom is larger again than Angkor Wat but the temples here are easier and quicker to explore albeit spread quite far apart. The main entrance gate (South Gate) sits just west of the moat at Angkor Wat and there are further gates leading North, East and West to other parts of Angkor. A number of Angkor Thom’s main attractions include Bayon with 23 towers each carved with smiling Khmer faces (below left) and Baphuon a three-tiered temple mountain with an stretching walkway. “The One with the Trees” as it’s often better known. Ta Phrom is one of the most extraordinary temples I’ve come across in my travels and, where most of Angkor’s temples have been fixed or rebuilt, Ta Prohm has been left to its original condition with trees growing through temple ruins and the entire site seemingly gobbled up by the jungle. 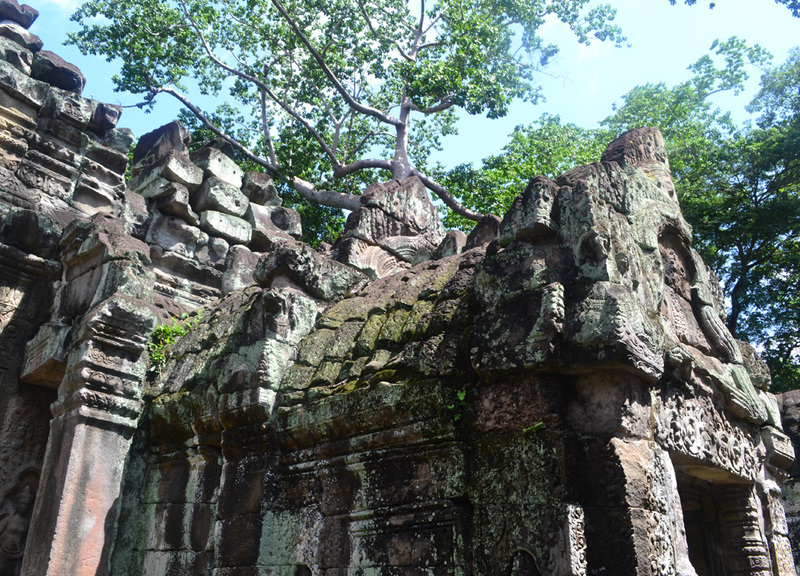 If I were to chose to visit only one temple in Angkor, Ta Phrom would be it. Passing Angkor Wat, through Angkor Thom’s South Gate, out the North, then veer to the Northeast. This is where the Grand circuit begins. This circuit takes a full-day (similar to the small circuit) but the route is more extensive so the tour costs a touch more (around $18 by Tuk-Tuk). These temples are quieter but will still have a trickle of tourists passing through. For the Grand Circuit it is simple to add or take temples from the itinerary so what we show below is the basic Grand Circuit Tour. Much of this area was in fact covered by water in ancient times and many of these temples were man-made islands. Another vast temple compound surrounded by a wide moat and with expansive reservoirs nearby. Similar to Ta Prohm (the tree temple) Preah Khan has been left from restoration and, again like Ta Phrom, there are towering trees growing through the ruins at the far entrance. This will be the most strenuous visit of the Grand Tour. Located not far from Preah Khan (above) Neak Pean was built in vast water reservoirs (baray) which surrounded the now temple ruins. Neak Pean is ‘the hospital’ (more like a spa) where belief was that bathing in the water pools would cure disease and heal illness. This area is a welcome escape from days of non-stop ruins, jungles and temples. A quick in-and-out temple with one single shrine on one level. Ta Som is surrounded by an enclosure and compound walls (but little else goes on here). Small, simple and somewhat cute with unique Khmer carvings and more temple eating trees. 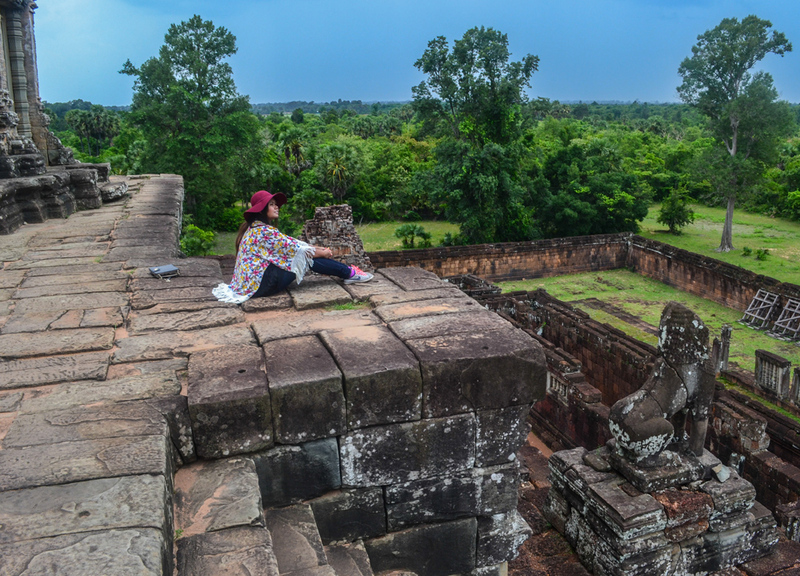 Another not so strenuous visit is East Mebon which sits directly next to the passing road and is an easy three tier climb to reach the top. 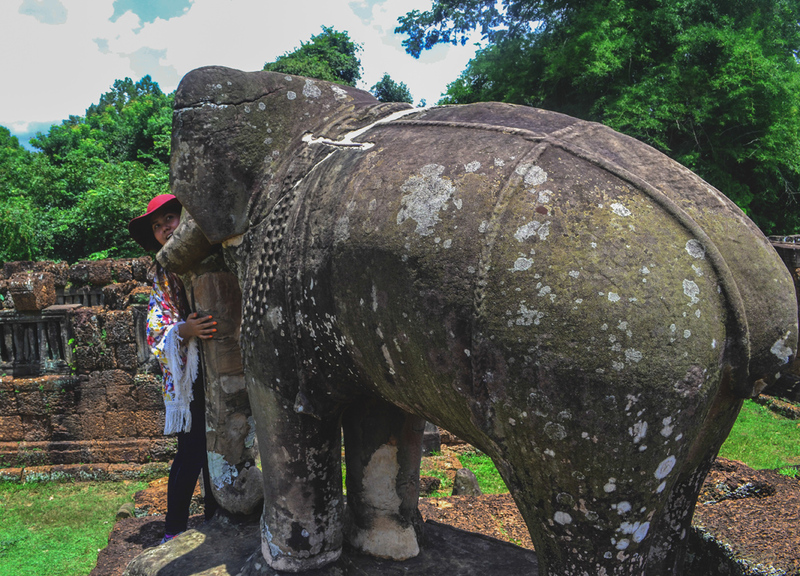 At each corner of East Mebon are two-meter tall stone elephants and various Hindu shrines are dotted throughout the temple. East Mebon was, at one time, surrounded by waters and could only be reached by boat. Another easy to climb temple and again located right next to the road. 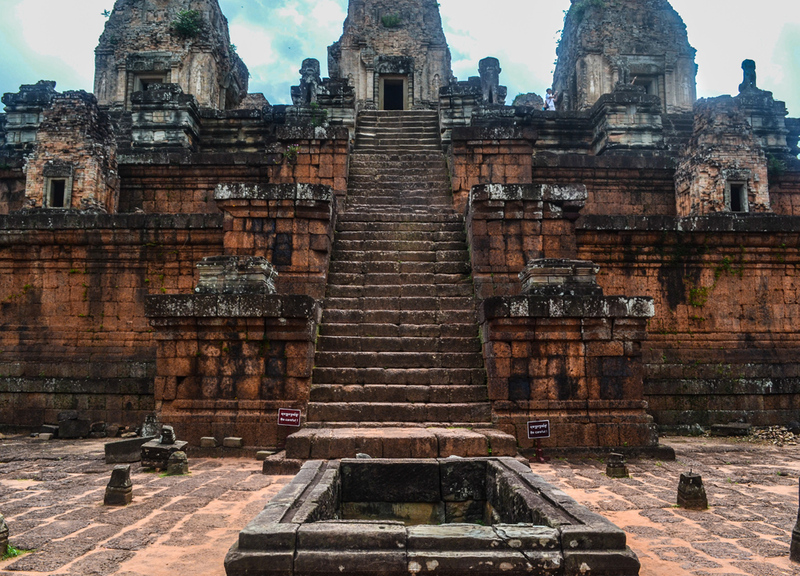 Pre Rup was also an artificial island with surrounding reservoirs and (while much remains unknown in Angkor) is believed to be where funerals took place and the walled pit found directly on entering may have been used for cremation ceremonies. There’s plenty of opportunities to pick up drinks, refreshments and the usual tourist knickknacks along each circuit and prices aren’t overly extortionate; roughly $1 for fizzy pop and $1.50 for a small Angkor beer. Nearer the end of circuits you’ll also find air-conditioned restaurants offering overpriced and mediocre food alongside chockablock tables of tour groups (as expected). On our first day, having neglected to charge camera batteries, we had the Tuk-Tuk bring us back to Siem Reap for our hotel. We ate breakfast, recharged batteries, took a nap, showered then returned again to explore Angkor (no extra charge). Tuk-Tuk tours tend to be flexible so feel free to create your own itinerary and introduction to Angkor. Wow – a useful post with lots of lovely pics! I’ve been to Angkor, it was amazing, and info like this really helps tourists to enjoy it and plan enough time to see it. I wish I had had an extra couple of days! 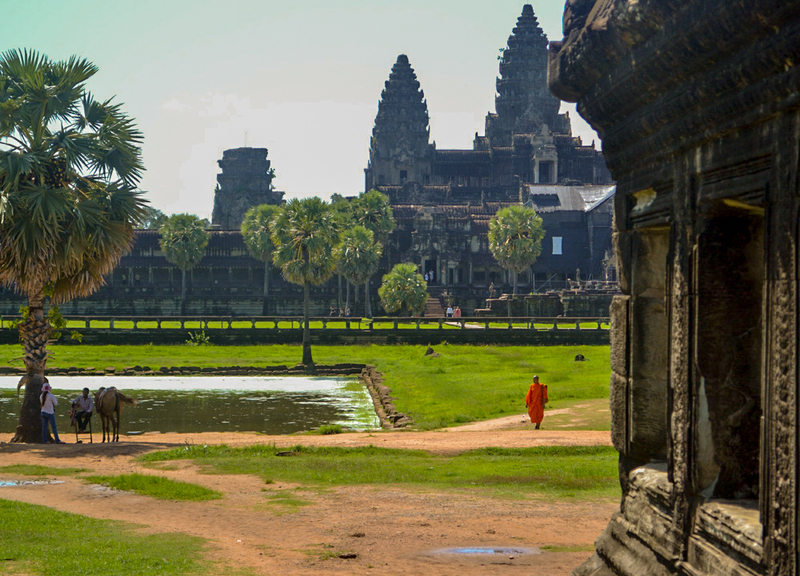 Incredible photographs, I’d love to go to Angkor Wat and have seen a lot of travel bloggers singing it’s praises. Interested to know though, was it really touristy when you were visiting? Thanks Charlie. This was my second time visiting and the crowds were no more than my previous (8 years ago). It was rainy season this time so maybe we got lucky. In comparison to many places in SE Asia I’ve seen a lot worse e.g. Thai islands and pretty much all of the South of Bali. I’ve never been to Cambodia but hopefully in the future. Whilst I’ve heard of Angkor Wat I didn’t realise it was so diverse with so many wonderful and interesting sites. With those prices and attractions I think a leisurely 7 day pass would be perfect. Good read! I went to Cambodia last week and did the small circuit tour. I will definitely come back and visit the other temples. Btw, your photos are beautiful.